As you all well know, I can sometimes be a veggie-phobe. Yet for some reason as the sun comes out and the temperature rises, even I can be tempted. Last Friday me and my husband, Chef Edwin and his lady friend and some bake-a-thon alums got together at Edwin’s for a happy hour cook-out. You would never, ever catch me putting raw onion slices or green pepper on my burger, but if you dice it and roll it into the patty, I’m sold. Though I still ate way too much food at the cook-out, with some veggies in the patties at least I did sneak in more vegetables than usual! I’ve been told that most people aren’t like me in that they actual revel in eating fresh vegetables, but if you know and love a fussy eater (spouse, significant other, child, etc. ), consider add vegetables to your patties. Dicing veggies to a small size will work best. 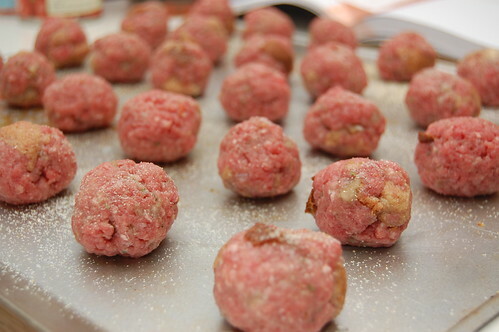 This will also work well for meatballs.